Professor Quirinus Quirrell (26 September, possibly in the 1950s or 1960s - 4 June, 1992) was a half-blood wizard who attended Hogwarts School of Witchcraft and Wizardry and was sorted into Ravenclaw House. He was the Muggle Studies professor at Hogwarts, though he later became the Defence Against the Dark Arts teacher during the 1991–1992 school year. Before teaching Defence Against the Dark Arts, Quirrell went out in search of Lord Voldemort, believing he could achieve recognition for finding him and could learn things that would ensure that no one laughed at him again. However, Voldemort, after finding out that he taught at Hogwarts, took over his body, though Quirrell put up some feeble resistance. He died when trying in vain to murder Harry Potter. Quirinus Quirrell was born somewhere in the British Isles, presumably in the 1950s or 1960s, and attended Hogwarts, where he was Sorted into Ravenclaw House in the 1960s or '70s. It is likely that he acquired his wand from Ollivanders when he was eleven. As a boy, Quirinus was a gifted but also delicate, teased for his timidity and nerves during his school life. Feeling inadequate and wishing to prove himself, he developed an (initially theoretical) interest in the Dark Arts. The feelings of insignificance and worthlessness that this bullying fostered embittered the boy, forging a latent desire to make the world sit up and notice him. He also most likely obtained a high-graded O.W.L. and N.E.W.T. in Muggle Studies and Defence Against the Dark Arts, since not only did he go on to teach both but was also noted to have had a gift for the theory of Defensive Magic. After teaching Muggle Studies for some time, he took a year-long sabbatical in 1990 in order to "gain first-hand experience", though in reality he had taken a 'Grand Tour' around the world in order to hopefully find whatever remained of Lord Voldemort after his first defeat, partly out of curiosity, partly out of that unacknowledged desire for importance from his childhood. At the very least, Quirrell fantasised that he could be the man who tracked Voldemort down, but at best, might learn skills from Voldemort that would ensure he was never laughed at again. His journey proved successful as he did indeed find Voldemort, though he was no match for the Dark Lord (even in such a weakened state) and when he realised that Quirinus had a position at Hogwarts, Voldemort used his charisma to manipulate Quirrell to serve him. Quirrell also adopted a turban for everyday use after this sabbatical, claiming to have received it from an African prince as compensation for disposing of a zombie. It was also rumoured that he encountered vampires in the Black Forest, in Albania, and had a nasty bit of trouble with a hag. Quirrell at some unknown point prior to 1991 came into possession of Vault 998 in the new vault area of Gringotts Wizarding Bank. He kept a small box containing various belongings, a large crate, and a chest containing Circe's Chocolate Frog Card that was given by Cuthbert Binns to James Potter before Quirrell came into possession of it. Quirrell spent his last year of life attempting to procure the Philosopher's Stone for Lord Voldemort, who used his nervous disposition to his advantage, as his perceived lack of confidence had earned very little respect from the students at Hogwarts and consequently diverted suspicion away from his plans. Quirrell's first plan was enacted before the school term started and involved going to Diagon Alley in an attempt to steal the Philosopher's Stone from Gringotts Wizarding Bank for Voldemort. While in the Leaky Cauldron, he met Harry Potter, who had come with Rubeus Hagrid. Quirrell pretended that he was going to buy a new book on vampires. After this attempted break-in, he returned to Hogwarts to teach as Defence Against the Dark Arts while another wizard replaced him as Muggle Studies Professor. A few of his classes included the Curse of the Bogies, the Knockback Jinx, the Lumos spell and the Verdimillious spell. On Halloween, Quirrell allowed a troll to enter Hogwarts as a diversion, and sneaked to the restricted Third Floor Corridor where the Stone was being hidden. Severus Snape, who suspected Quirrell, followed him, and was bitten by the three-headed dog Fluffy in the process of trying to head Quirrell off. Later in the year, during a Quidditch match between Gryffindor and Slytherin, Quirrell made his first attempt at Harry Potter's life. He jinxed Harry's broomstick to try to throw him off, but Severus Snape interfered again with a counter-curse. It was Hermione Granger who ultimately stopped Quirrell by rushing to set fire to the robes of Severus Snape (whom she believed was jinxing Harry's broom), and in the process, causing Quirrell to break the eye contact necessary for performing his spell correctly. When Harry, Ron, and Hermione believed that Severus Snape was trying to intimidate Quirrell into helping him steal the Philosopher's Stone, they tried to be supportive and encouraging to Quirrell whenever possible by telling people off for laughing at his stutter, or winking at him encouragingly whenever they passed him. Later that year, in order to keep his master alive, Quirrell began to prey on unicorns in the Forbidden Forest and drink their blood. He met Harry, Draco Malfoy and Fang there, and was about to attack Harry when Firenze rescued the boy. About a week before Harry's exams, Voldemort ordered Quirrell to try to get the Stone again. Harry overheard this, and mistook the conversation for an argument between Snape and the Defence teacher. That night, after Dumbledore had left for London , both Quirrell and the Trio went through the obstacles blocking the way to the Stone. To get past Fluffy, Quirrell disguised himself and lured Hagrid into a card game by betting a dragon's egg. During the game, he managed to draw out information about Fluffy by convincing Hagrid that he was a Dragon dealer, and as such, shared Hagrid's penchant for dangerous pets. In Hagrid's enthusiasm, and most likely under the influence of alcohol, he let slip that playing music for the three-headed dog would put him to sleep. Quirrell then sent a forged letter to Professor Dumbledore summoning him to the Ministry of Magic to get him away from the school. He went after the Stone, but was followed by Harry Potter, Ron Weasley and Hermione Granger — though they believed their enemy to be Severus Snape. Quirrell was able to penetrate the first six chambers that protected the Philosopher's Stone, including the chamber in which he himself put a Troll. He reached the final chamber only to find the Mirror of Erised, and was unable to figure out how to take the stone from it, going so far as to consider smashing the mirror. Eventually, Harry alone managed to reach the last chamber, and was surprised to meet Quirrell instead of Snape. Quirrell non-verbally bound Harry and summoned a wall of fire behind the door to prevent him from escaping, then, on Voldemort's command, forced Harry to look into the mirror. Harry saw his reflection with the Stone in his own trousers' pocket, and felt it indeed being transferred to his real pocket. When Harry lied about what he saw in the mirror, Quirrell unwrapped his turban to reveal Lord Voldemort's face, bound to the back of his head. Quirrel's life ended then, when Voldemort forced him to attempt the murder of Harry Potter (figuring out Harry had the Stone and being unable to persuade him to give it willingly). Unfortunately, the body Quirrell and Voldemort were both sharing manifested in burns and blisters during his fight with Harry due to the protective power Harry's mother left in his skin when she died for him. Harry collapsed from the pain in his scar, but Quirrell's body was burnt so horribly that Voldemort dispossessed his body and left him to collapse and die. However, despite being effectively turned into a living Horcrux for the last year of his life, Quirrell did not ultimately lose his soul, having even tried to put up feeble resistance on occasion (in spite of the fact that Voldemort was far too strong for him). In 1995, the then Defence Against the Dark Arts professor Dolores Umbridge mentioned him when she was criticizing the past DADA professors for not teaching them things that would pass a Ministry inspection, considering that he was a possible exception due to teaching "age-appropriate subjects". Harry then retorted that Voldemort was on the back of his head, earning him another week's detention. Quirrell was a young man with a very pale skin tone and light blue eyes. When Quirrell returned from his sabbatical in Albania, one of his eyes developed a twitch and he appeared quite pale and anxious and frequently stuttered. At the start of the term, he was wearing a purple turban. He was usually trembling and prone to fainting. Near the end of his life, his reason for wearing the turban became clear. Quirrell had joined with Lord Voldemort and agreed to allow Voldemort's fledgling body to latch on to the back of his head. It was only able to grow into a face, and used Quirrell for transportation and sustenance. Quirrell was a gullible, weak-willed wizard who was easily corrupted. Due to his childhood of being teased and neglected for his timid nature, he came to develop a latent desire for recognition and greatness, cynical feeling for society, and was seduced by the Dark Arts, no matter how subtle the lure appeared at first, which led him to foolishly search out for Lord Voldemort's remains in the hopes of fame and knowledge, while exposing his impressionable and naive side to the fallen Dark Lord. When Quirrell met Lord Voldemort, he arrived at the conclusion that "there is no good and evil, there is only power, and those too weak to seek it". Quirrell generally did his best to serve Voldemort, though he admitted that his attempts were not always successful, seeing as he was being given rather tall orders. Despite Quirrell's continuous descent into corruption, he at least had one piece of redemption of attempting to resist Voldemort's soul of possessing his body, feeble and futile though it may be. Throughout the school year, Quirrell appeared nervous and timid. He frequently stuttered and was mostly an incompetent teacher. Though his nervousness was probably very real due to the enormous pressure being put upon him by Voldemort, Quirrell had a chillingly sinister side that most people never saw. He was extremely adept at conniving and manipulation; at one point, he disguised himself and tricked Hagrid into revealing crucial information on how to get past one of the obstacles protecting the Philosopher's Stone. Another time he let a fully-grown Mountain Troll into the school on Halloween as a diversion while he headed off to the third-floor corridor and tried to penetrate its defenses. He even managed to deceive the great Albus Dumbledore by forging a Ministry letter to him to lure him away from school. Quirrell was known to have a brilliant mind and had an excellent aptitude for theoretical learning, particularly when it came to Defensive Magic (though was less competent in the application of that knowledge). Whilst this made him a highly intelligent student and a good teacher it did not make him a great wizard, his practical aspect severely hampered by his timid nature. Indeed, most of the power he displayed appeared to be the result of his possession by Lord Voldemort, whom he was noted to have gained a significant amount of power from. Charms: Whilst the true extent of Quirrell's expertise in this area is unknown, he does teach several charms during his Defence Against the Dark Arts classes such as Verdimillious Uno and Lumos and so at least has some basic skills in charming (at least, with regards to the theory). He was also able to conjure a non-corporeal Patronus a very advanced piece of magic. Transfiguration: Quirrell was apparently skilled with conjuration, a difficult branch of Transfiguration. He could conjure ropes, both non-verbally and verbally. Defence Against the Dark Arts: Quirrell was noted to be learned in the theory of Defensive Magic and as such was hailed as a good teacher by Ministry of Magic standards. This is exemplified by his ability to teach his First Year class the aforementioned spells Verdimillious Uno, Lumos, the Curse of the Bogies and the Knockback Jinx. Still, whilst this all made him a great teacher of D.A.D.A. it did not make him a good practitioner. Non-verbal magic: Quirrell was capable of performing non-verbal magic, conjuring ropes without a wand. Whilst this could easily have been the result of his power boost received from Lord Voldemort's possession, Quirinus was the possessor of an alder wand (which emphasises nonverbal magic) and hence it is likely that he was already truly skilled in this area of magic prior to his meeting with the Dark Lord. Creature expert: He was uncommonly gifted with trolls being able to bring one into Hogwarts on Hallowe'en. He was somehow able to acquire a Norwegian Ridgeback dragon egg to give to Hagrid. Quirinus Quirrell first met Lord Voldemort in 1991, in the forests of Albania, where Voldemort subjugated Quirrell into servitude. Quirrell brought him back to England, and eventually to Hogwarts. The Dark Lord planned to obtain the Philosopher's Stone and fabricate the Elixir of Life to acquire a body. Quirrell attempted to infiltrate Vault 713 of Gringotts Wizarding Bank, in order to steal the Philosopher's Stone. Quirrell managed to break in, but found the vault had been emptied by Rubeus Hagrid and Harry Potter earlier that day. Following this failed attempt, Voldemort began a parasitic relationship with Quirrell, in which he attached himself to the back of Quirrell's head, to ensure his plans were being followed precisely; throughout the year, Quirrell attempted to resist the possession, feeble and futile though it may be. Voldemort ordered Quirrell to kill Harry Potter, though Quirrell's attempts to do so were thwarted by Severus Snape and Hermione Granger. Harry penetrated the Philosopher's Stone Chambers in pursuit of Snape, or so he believed, only to find it was Quirrell in front of the Mirror of Erised. Quirrell, under Voldemort's orders, demanded Harry draw the Stone from the Mirror; though Harry was successfully able to retrieve the stone, he attempted to conceal the fact by lying about what he saw in the mirror. Quirrell revealed Voldemort, who tried to manipulate Harry into handing over the Stone by offering him the chance to see his parents, and upon Harry's refusal, ordered Quirrell to take the stone by force. Quirrell, sharing his body with Voldemort, found himself unable to touch "a person marked by something so good" (referring to Lily Potter's sacrificial protection). Voldemort separated his soul from Quirrell's body to escape the pain, and left Quirrell to die, as Albus Dumbledore noted, showing him as little mercy as he did his enemies. Three years later, after his return, Voldemort told his Death Eaters that Quirrell was a fool, and that he only allied with him for his position as a professor at Hogwarts. Harry eventually came to believe that Severus Snape was attempting to threaten Quirrell into helping him penetrate the defences surrounding the Philosopher's Stone, for Lord Voldemort. As it seemed like the only thing standing between Snape and a means of restoring Voldemort to power was Quirrell's will, Harry did what he could to encourage Quirrell and help build his confidence. As it turned out, Quirrell was a servant of Voldemort, and it was he, not Snape, who was aiming to steal the Philosopher's Stone for the Dark Lord, and, if possible, kill Harry along the way. When they met for the last time in the final of the Philosopher's Stone Chambers, Quirrell's connection to Lord Voldemort rendered him unable to touch Harry without experiencing unbearable pain, due to the enduring power of Lily Potter's sacrificial protection, and he died attempting to steal the stone from Harry by force. About four years after this, when Dolores Umbridge commented positively on Quirrell's teaching methods, Harry sarcastically agreed before pointing out the deceased professor's duplicity. A year after that, when Snape finally took over as the Defence teacher, Harry made a snide comment of Quirrell dying on the job, and hoped that Snape would also die. Quirrell generally got along well with most of the faculty at Hogwarts, including Filius Flitwick, Pomona Sprout, Minerva McGonagall and Rubeus Hagrid. Hagrid seemed to think highly of Quirrell, and considered him to be a very clever and talented wizard for his extensive world travels and experience fighting the Dark Arts. However, as Quirrell didn't show his true personality and it is possible he didn't like all of them. Severus Snape, however, was the only one who saw Quirrell for what he really was. His contempt partially stemmed from the fact that Quirrell was the Defence Against the Dark Arts Professor — a position that Snape had wanted for years. Snape may have guessed that Quirrell was hiding his true intentions, as he told him to "decide where his loyalties are", though Harry Potter and his friends believed that Snape was threatening Quirrell in order to get information about how to get into the Philosopher's Stone chamber. Years later, Snape described Quirrell as greedy and worthless to Bellatrix Lestrange and Narcissa Malfoy. As Headmaster Albus Dumbledore was a highly intelligent and powerful wizard somewhat suspected Quirrell's true nature; this is further evidenced by the fact he asked Snape to keep an eye on Quirrell. After the events in the Philosopher's Stone chambers, Dumbledore expressed his opinion to Harry that Quirrell, much like Voldemort, was flawed for his inability to understand "good and evil", and his desire for power. About four years after his demise, Quirrell's theory-based teaching method was praised by the then Defence Against the Dark Arts teacher, Dolores Umbridge, due to the Ministry's paranoia of the students training to become Dumbledore's private army. The name "Quirinus" is possibly derived from the Sabine word quiris meaning "spear". Quirinus was a Sabine and Roman god who was later identified with Mars. The name was also borne by several early saints. "Quirinus" is also associated to the Roman god Janus, as in Janus Quirinus. Janus, the Roman god of beginnings and transitions, is often depicted as two-faced, with one visage looking forward, to the future, and one looking back, to the past. This image is reminiscient, of course, of Voldemort's face set opposite Quirrell's own. Quirinus Quirrell was played by Ian Hart in the film adaptation of Harry Potter and the Philosopher's Stone. Archive footage of Quirrell from Philosopher's Stone appears in the "Prince's Tale" sequence of Harry Potter and the Deathly Hallows: Part 2. David Thewlis, who went on to play Professor Lupin in the film adaptations, was at one point considered for the role of Professor Quirrell. Quirinus Quirrell served as a temporary Horcrux when Voldemort's soul possessed his body in 1991. But the piece of the soul lived on, when Quirrell died, and was destroyed six years later, when Voldemort was killed. Quirinus was a Roman god about whom there is not much information, although he is commonly associated with war — a clue that Quirrell is not quite as meek as he appears. 'Quirrell', which is so nearly 'squirrel' — small, cute and harmless — also suggested 'quiver', is a nod to the character's innate nervousness. Quirinus is also used as an epithet for the Roman god Janus, a god with two faces similar to Quirrell after he was possessed by Lord Voldemort. This could be clue to the malevolence of his character. Janus was the god of beginnings, and Quirrell was the first one to find Voldemort in Albania, thereby beginning the Dark Lord's rise to power, in a way, and was the first Dark Wizard that Harry ever directly confronted. On the student list shown by J. K. Rowling on Harry Potter and Me, a student named "Quirrell" was listed, but the name was crossed out with "Rivers" written above it. Quirrell was the first known Ravenclaw introduced in the series, though his house was only revealed on Pottermore. He is also the first Harry Potter character to be directly involved with Voldemort. Snape, who also appeared in the first book, is not at that point revealed as a former Death Eater. In the novels, Quirrell does not appear to have his turban until after his failed attempt to steal the Philosopher's Stone from Gringotts. 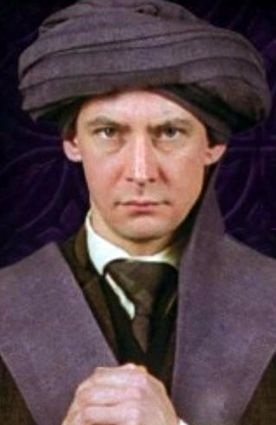 In the film however, Quirrell has his turban before the robbery. This change is indicated by the fact that he shakes Harry's hand at the Leaky Cauldron in the novel, but does not wish to in the film. However, not wanting to shake Harry's hand cannot be due to Voldemort sharing Quirrell's body, because as Quirrell dies, he does not understand what is happening to him (he yells, "What is this magic?!?"). In the films, Quirrell dies when Harry touches him and he disintegrates, Voldemort leaving his body immediately afterward. In the book, however, even though his death is not shown, it is implied by Voldemort in the fourth book that he died rather because Voldemort left his body, as opposed to Harry's love burning him. Quirrell is notable as being one of few wizards capable of performing intricate magic, like Dumbledore, without a wand; he can fly without a wand, conjure ropes by snapping his fingers, etc. It is possible that he had this ability because of Voldemort's possession of him, although Hagrid's high opinion of Quirrell suggests that Quirrell was a talented wizard. Quirrell is unique among Voldemort's followers as one of the few who use Voldemort's name. While the Death Eaters call Voldemort "The Dark Lord" when referring to him, Quirrell openly uses Voldemort's name when talking to Harry. Quirrell is a playable character in LEGO Harry Potter: Years 1-4. Despite dying in the first year, he can still be played in the other years and is seen at the end of Year 1 armless and heavily bandaged in the hospital wing. He is capable of using Dark Magic in the game. It is also possible to play both professor Quirrell in Voldemort form and his normal form with turban. However, he can only use Dark Magic when he is in his Voldemort form. In LEGO Harry Potter: Years 1-4 and the PC version of Harry Potter and the Philosopher's Stone, Voldemort spins Quirrell's head 180 degrees to face Harry. Quirrell can also shoot fireballs and create a ghostly green head that can hurt Harry. In all versions of LEGO Harry Potter: Years 1-4 and some of the video game adaptations of Harry Potter and the Philosopher's Stone , Quirrell is misspelled Quirrel. ↑ 1.0 1.1 1.2 1.3 As Quirrell somehow came into possession of a Chocolate Frog Card that he knew Binns had given to James Potter while he was at school, and perhaps that he often called Snape by his first name, and the fact that Snape seemed to know him rather well, are possible implications that he attended Hogwarts at the same time as the Marauders? This would also make sense since Hagrid referred to him as being a "brilliant mind" while studying magical theory, and that he was gamekeeper during the 1970s while Ogg was previously. He was also described as a "young man" in 1991. This page was last edited on 9 July 2015, at 09:01. This text is available under the GNU FDL and may have been adapted from the Wikipedia article about Quirinus Quirrell (history).